Winners get everything pictured above. A.V. 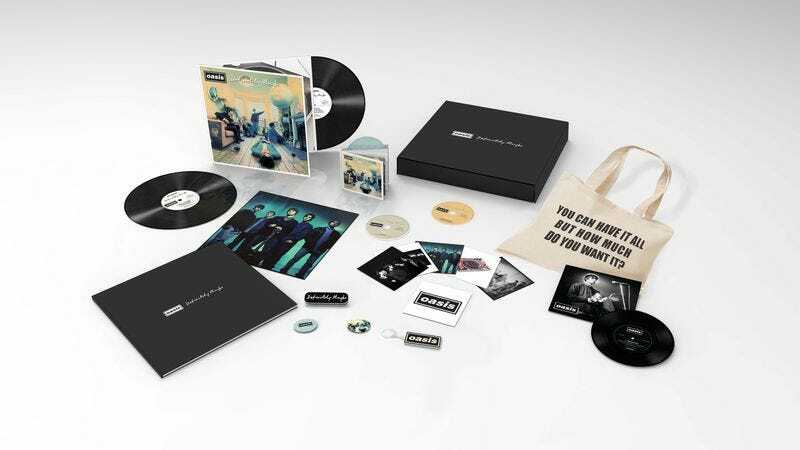 Club readers, here’s your chance to be a true “Rock ‘N’ Roll Star.” We’re giving away a copy of the super deluxe version of Oasis’ Definitely Maybe reissue to one lucky reader. Out tomorrow, May 20, the set comes with a double LP and CD copy of the classic 1994 record, as well as CD versions of various b-sides and unreleased cuts. Also included is a 56-page hardcover coffee table book, a commemorative box, an exclusive 7-inch of the band playing “Supersonic” and “Cigarettes & Alcohol” live, and various Oasis swag, like buttons, stickers, and a handy tote. The set goes for £100 on the band’s website, or about $168 with today’s exchange rate. To enter, simply e-mail avcontests@theonion.com with the subject line “Oasis.” Include your full contact information, including your mailing address. The contest ends Sunday, May 25 at 11:59 p.m., and winners will be notified shortly thereafter.